Use job networking letters to directly ask for a job, or to request help or advice during a job search. Customize your networking letters based on the contact (the letter’s recipient) and the situation at hand (the purpose of your letter). A chance encounter. 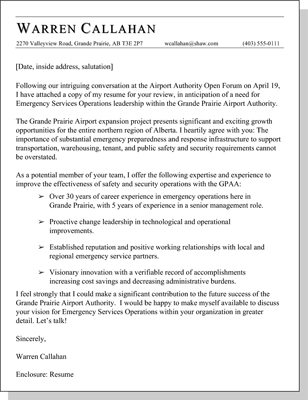 A Canadian airport executive (Callahan) turns a meeting at a public forum into an interview opportunity and follows up with a cover letter and resume that spell out exactly why he can be a leading candidate for an emergency services position at a larger airport. Being prepared to write a quality cover letter and to customize a core resume are skills that capitalize on unexpected opportunities. 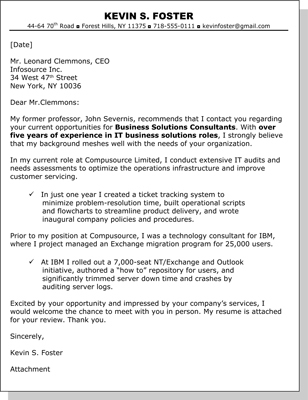 Click here to view this job networking letter. An alumni endorsement. Applying to become a business solutions consultant, a candidate (Foster) connects with the letter recipient quickly by stating that a former professor recommends the contact. Professors typically have their referral plates full with requests from current graduates. The candidate will be perceived as above average when a professor is willing to reach back five years to endorse an alumnus. Credit: Barbara Safani, MA, CERW, NCRW, CPRW, CCM — New York, N.Y.
Advance selling. 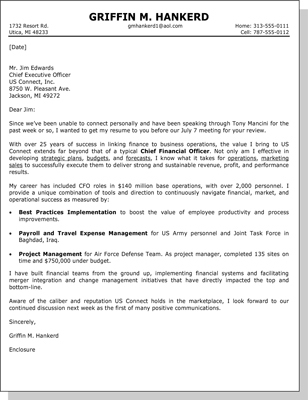 A financial executive (Hankerd) with exceptional government contracting expertise breaks out on his own with a networking letter after originally being filtered through a network contact. Even when the employer doesn’t read the resume in advance, the letter quality suggests that the candidate knows how to handle himself in business, confirming the mutual friend’s recommendation. Credit: Erin Kennedy, CPRW — Lapeer, Mich.